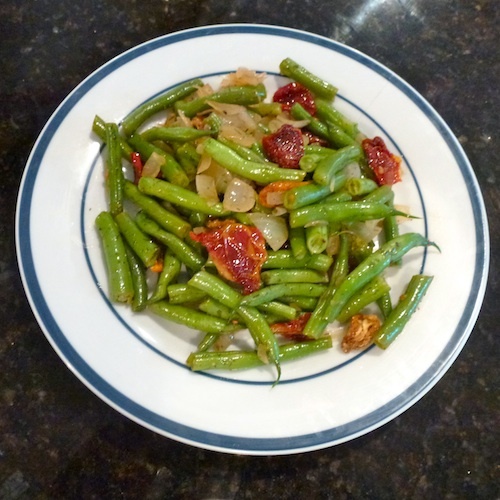 Green Beans are a summer favorite I seldom eat in winter. Because as you know, everything tastes better home grown and garden fresh. Green beans are grown from Renee’s Garden seed. I pulled the onions from my garden the last week of June. At first the beans were being eaten up by bugs and bunnies. The bunnies came and went. Bigger gardens next door or a neighborhood full of cats and dogs sent the bunnies on their way. Repeated Safer’s Soap sprays slowed down the bugs. I’m growing “Tricolor Bush” and “Tricolor Pole”. Why bush and pole? because the pole beans are ready about a week after the bush beans. I’ll keep replanting beans and hopefully get another crop or two here in Missouri. We love pickled green beans. These long straight beans are meant to be stuffed into tall skinny jars and pickled. They are refrigerator pickles, meant to be eaten fresh out of the jar. My crisp pickled beans are not cooked by the long process of canning. Maybe we will have enough to freeze a few of these three colors of long straight green beans. The multi colored beans are beautiful in winter time vegetable soup. “Roland” is a “haricot vert” of filet bean. Pick them and cook them. These straight, skinny beans are tender and need very little cooking. long and deep green filet or “haricot vert” snap beans. These are a long, skinny French bean that does very well in my zone 6A home garden. They grew in a square 4′ x 4′ garden. Every week for four weeks I planted another quarter of the garden. It kept us in fresh beans and a bit more to share with Neighbor Patty. They are extra-crispy, making it possible for Jules and I to come to a middle ground in the kitchen. One of us likes Southern style “cooked to death” green beans and the other likes the California style “crispy and full of vitamins” version. Green Beans are meant for sucession planting. 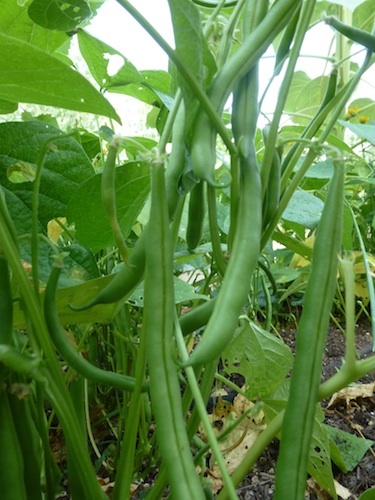 Planting one patch and a little later planting a few more beans will stretch out fresh green bean season spring to fall. The best way is to plant a few beans, or part of a row every week. When the first plants are finished producing beans, cut them down, mow them or, snip off the plants. Replant that spot again with more green beans. If you want to freeze or can a lot of beans at once, this method is not for you. If I have a few too many green beans, I can share them with the neighbor. Or, it is quick to blanch and freeze a quart size plastic zipper lock bag of green beans. Next, I’ll plant cow peas. Had to do a little research on how to harvest and store onions because I’ve never had much luck growing them before. It was not a great crop. But the variety of onions were so much more successful than ever before. Red onions are still in the ground. As are the leeks and shallots. Garlic was lifted mid June. I’ve never lived where parsley grew as a biennial. Parsley has always been an annual in my garden. Until last summer. Instead of it growing about a foot tall, it grew to about three feet. Then, this overachiever bloomed. That’s when its family tree became apparent. Parsley (Petroselinum crispum) is a member of the carrot family. When it blooms, the family resemblance to its cousin, Queen Ann’s Lace (Daucus carota), is striking. This year, volunteer parsley have appeared where the giant grew and self-seeded last summer. The self-seeded plants came weeks ahead of the seeds I sowed. If you are content to let the parsley grow where ever it wants, you won’t have to disturb the fussy tap-root. Allow parsley to self seed for an earlier harvest. • Wash and chop the leaves. Fill an ice cube tray with the leaves. Add water (or vegetable broth) to fill the cups of a plastic ice-cube tray. Place in freezer until the cubes are frozen. Pop the cubes out and store in an airtight container in your freezer. Thaw when needed by dropping a cube into soup or sauce. • You can make a parsley pesto in the same way you make your favorite version of basil pesto. Dry parsley if you must, but its color is dull and the flavor is similar to notebook paper. • Parsley butter will also preserve the color and flavor better than drying and freezes well. Read Herbal Butters and Oils: Garden Herb Butter to learn more. Remove the stems in recipes calling for fresh parsley. I always plant and grow twice as much parley as I need because parsley is a wonderful choice for attracting black swallowtail butterflies. Curley and flat-leaf parsley have a very high vitamin C content. It also contains vitamin A, B1, B2, calcium, iron, and anti-inflammatory flavonoids. Other herbs in a butterfly garden should include dill and fennel. Parsley, dill and fennel are taking over my Zone 6 garden. If you let these herbs self-seed they will come up earlier and hardier than the seeds you sow this spring. If you are not obsessed with growing plants in straight lines or rows, the self-sown plants are a bargain. They don’t all come up at once, which will extend your harvest season. My “Free Seed Packet” giveaways are attracting readers to this Herb Companion Blog and, the seed companies are very generous. I love introducing you to some of my favorite seed sources. In addition to the volunteer parsley, I am growing Italian ‘Gigante’ parsley from Renee’s Garden. There are a lot of new herb gardeners out there. So, when I mention seed sources, they consistently deliver the products they advertise on time with a generous seed count. Their seeds thrive in my garden. Renee’s Garden has volunteered three packets of Italian ‘Gigante’ parsley to give away. It is not too late to plant seed. Just be mindful of the moisture and never let the soil or seedlings dry out.